Whenever my friends and I talk about food, nothing divides the group more than when we discuss what goes into a ‘sweet and sour’. I’m firmly in the anti-pineapple camp but that’s because my husband makes a wicked pineapple dipping sauce which we have with our sweet and sour, not in it! 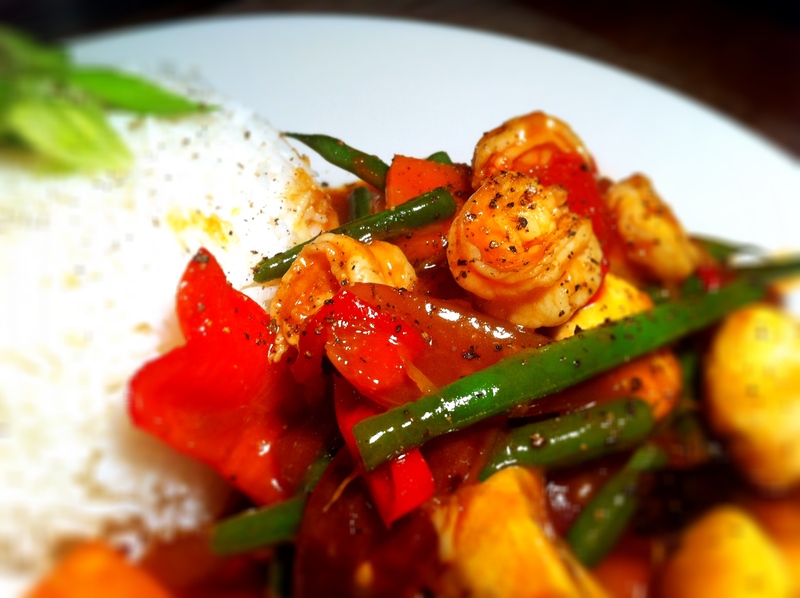 Tonight, we decided to have sweet and sour prawns with rice, and as we’re going away this weekend, this dish is a great way of using up any odd bits of vegetable still left in the fridge. Best thing about making this dish? The fact that it’s another one of my 30 minute kitchen-to-table recipes… in fact if you work fast, you can actually make this in about 20 minutes tops! I’ll be back on Sunday with what I hope will be a lovely sweet treat so till then, have a brilliant weekend! In a mortar and pestle, pound ½ cup of fresh pineapple chunks with a pinch of salt, a small hot chilli, 2 teaspoons of fish sauce, 2 teaspoons of sugar and 1 teaspoon of chinese rice vinegar (or whatever vinegar you have). 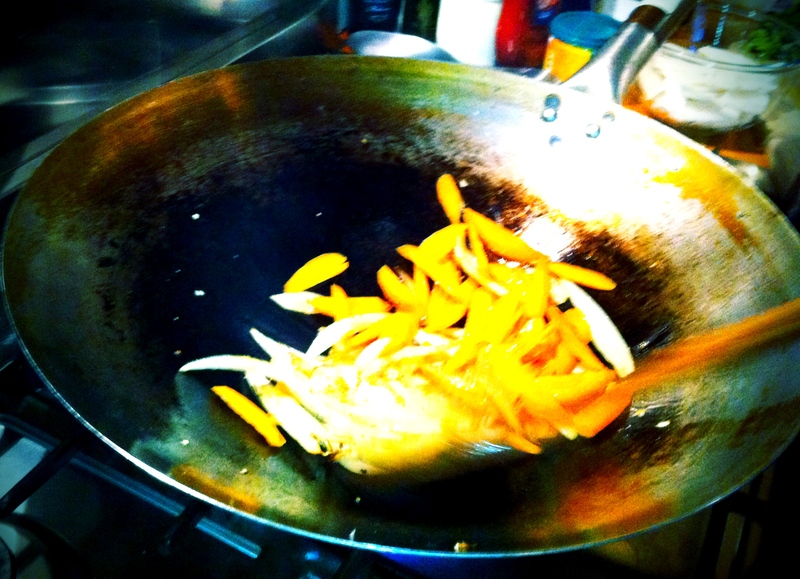 Get your wok nice and hot! In a wok or deep fry pan, heat your vegetable oil and start frying your onions, turning them frequently so they don’t brown too quickly. Fry the onions for about a min before adding the carrots and minced garlic and ginger. Fry this for another minute before adding the rest of your vegetables. Fry for another minute. 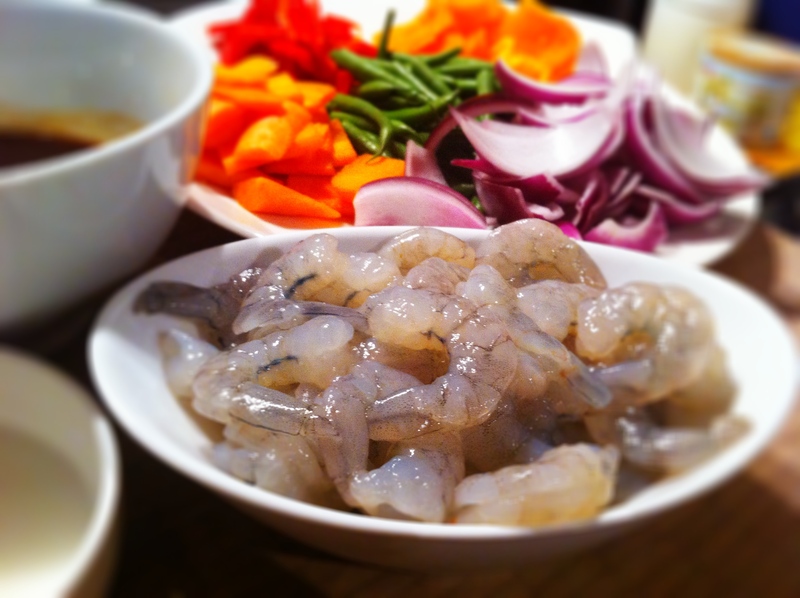 Add your prawns, give it a quick toss and then pour your sauce. Fry everything for about 3 minutes, during which time your prawns will have curled up and turned pink. Last of all, pour in your cornflour mixture and keep stirring until your sauce thickens and becomes glossy. Serve it with plain boiled rice garnished with some spring onions. This looks delicious! I’ve always been put off sweet and sour because the ones from pakcets are disgusting. I really should try making my own! looks gorgeous, I can almost taste it. Wow! great pictures! looks fantastic! Looks delicious! 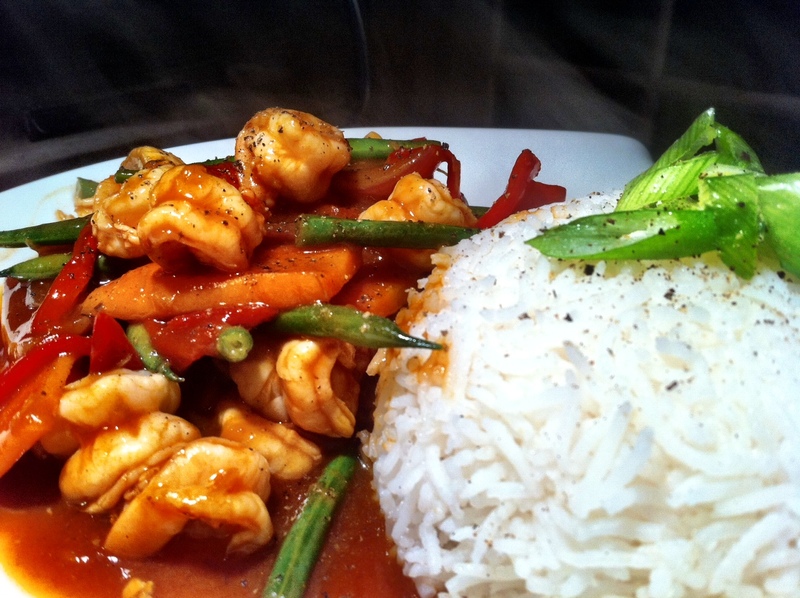 I can’t believe the great timing, my boyfriend and I were craving a sweet and sour prawn yesterday but we were worried it would take too long to make. We’ll definitely have to try your recipe! 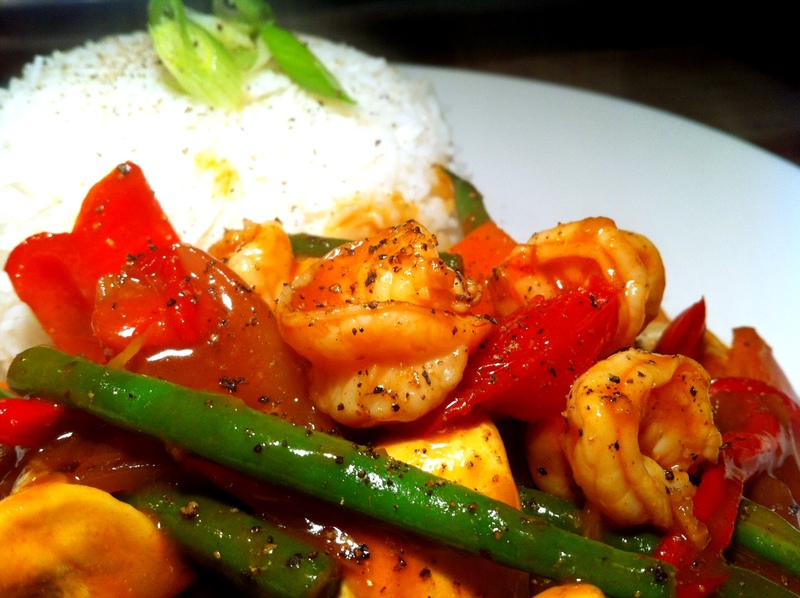 I’ll have to try this, I love sweet and sour anything, but shrimp makes it really luxurious.